Bad breath is one of my biggest pet peeves. There is literally nothing worse than someone eating grilled onions for lunch and you having to smell them thought out your conversation. Did you know that 99.9% of people who chew Extra® Gum experience 100% less bad breath? Okay, so I might have made up that statistic, but still, there is really no reason for bad breath when there are great solutions like Extra® Gum within reach. Instead of being grossed out or annoyed, do what I do and offer everyone gum. I have packs of Extra® Gum all over the place: In my cupboards, in my desk drawers, in my diaper bag, in my handbag, in the car, even in my gym bag, the minty goodness is always within reach. Now with the new 35-stick packages of Extra® Gum Spearmint and in Extra® Gum Polar Ice® flavors I will have even more to share and split up between my gum stashes. Last year I started boxing and I currently attend boxing 5-6 days a week. Because my gym is so tight knit (everybody knows everybody), we like to hangout before and after class, it’s like my “gym family”. I love having Extra® Gum in my gym bag to share, and so I feel more confident when talking to my friends and coaches, especially when one comes up to my bag to coach me one-on-one. The way I see it, if I’m going to be at the gym sweating my brains out, I might as well have good breath. 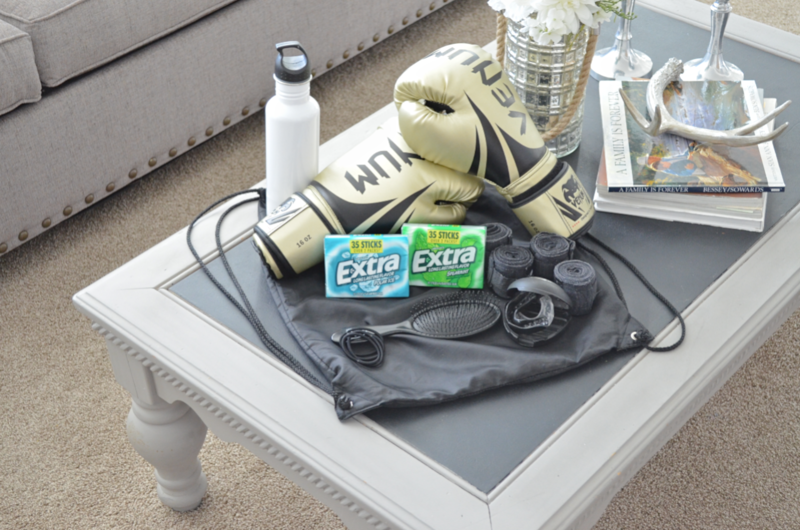 Even though this a “what’s in my boxing gym bag” post, you can and should add Extra® Gum to any gym bag. If you haven’t done this already, do it! Then you’ll be able to Give Extra Get Extra all the time, your friends will thank you later. Obviously I can’t box without my gloves and this metallic color is perfect, just call me “Goldie”. I didn’t know how much support these truly gave be until I tried to box without them. I always have multiple sets of hand wraps, it’s nice to alternate and you won’t have to do laundry as often. When I’m dealing with headgear I have to put my hair into a braid. Having a brush and hair ties saves me time and tangles. Safety first. Always, ALWAYS use a mouth guard when sparring other people. Remember, if you don’t have teeth, you can’t chew gum… So… Make sure to look for the new 35-stick packages of Extra® Gum Spearmint and in Extra® Gum Polar Ice® flavors in the checkout line at Target. What flavor do you prefer, Spearmint and in Extra® Gum Polar Ice®? I’d love to hear what you think of the new packaging too!